On our last night in Edinburgh we had a fancy meal planned. Any herbivore in the city has a duty to go to David Bann’s restaurant and so, for the first time ever, I did so. It’s a lovely restaurant, with some enticing (and clearly marked, right down to the beverages) vegan options on the menu. My starter was the tofu and broccoli fritters, pictured above. 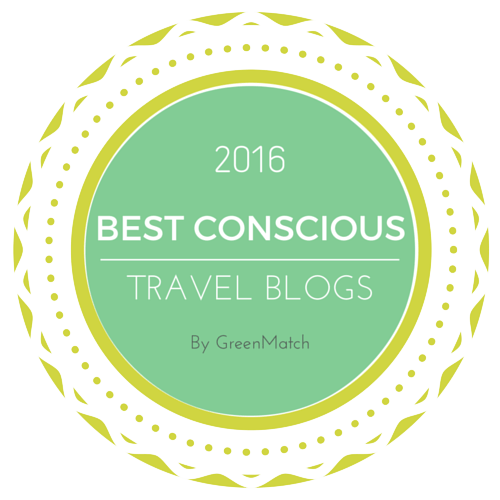 Inside the deep-fried balls was a cube of tofu encased in a broccoli patty – a great mix of textures. 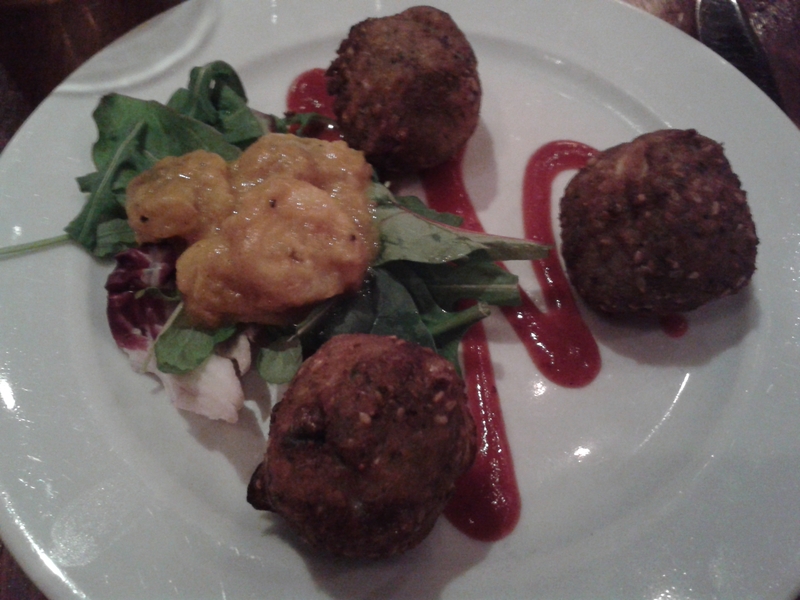 The fritters were served with a banana chutney. I have very strong feelings about involving banana in a savoury dish (it is wrong on every level), so that combination was not for me, but the fritters themselves were beautiful. 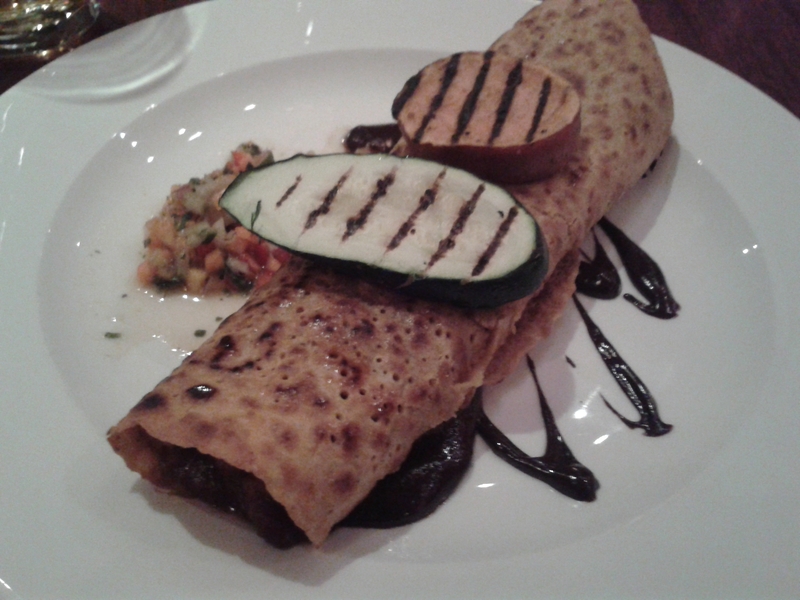 My main was the highlight of the evening: a pancake stuffed with spicy beans, drizzled with chocolate and served with griddled veg. It was a Mexican delight. The spicing was just right for my tastes, though there was a little too much chocolate for my liking. Mixing sweet and savoury is very much a struggle for me, and while a bit of dark chocolate is beautiful in a Mexican dish, too much can make it feel like a dessert. And finally, my dessert was a tropical concoction of rum and coconut sorbet atop mint and raspberry jelly, on a slice of caramelised pineapple, surrounded by Amaretto-soaked figs. Written down, that looks like a lot. And truthfully, it was a lot. It has often been said that I’m quite a simple person, and I like that kind of simplicity in my desserts as well. Just the jelly and ice cream would have been quite enough for me, I didn’t need anything else fighting for my attention. 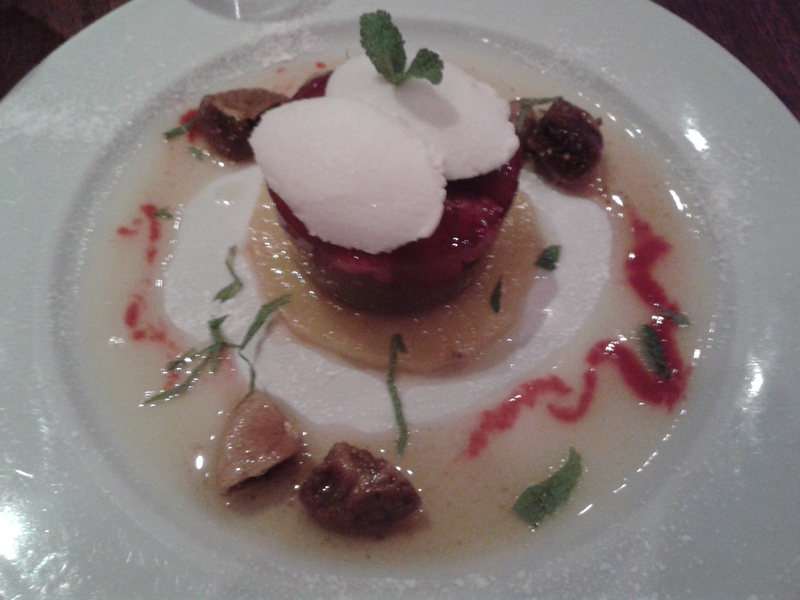 Ordinarily I wouldn’t go for such a fruity and complicated dessert, but it was the only vegan option (besides plain ice cream/sorbet) – I think that is the only thing David Bann’s could do better. I would definitely go back again, and consider it to be one of the fancier vegan meals I’ve had this year. For Sunday lunch, before hopping on the train home, we had a quick meal in Henderson’s, the only eatery of the weekend that I’d actually visited back in my student days as a vegetarian in Edinburgh. Back then Henderson’s was only a little bistro, whereas now it has added a deli and a restaurant – I’m delighted to see that business is booming! And the food was just as good as I’d remembered. 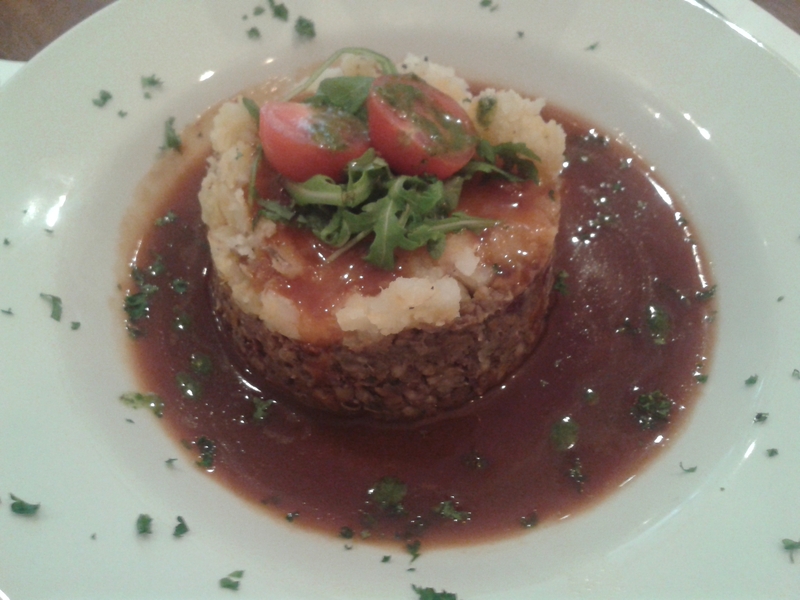 To celebrate being in Scotland, I simply had to have the haggis. It was surprisingly meaty in texture, and the gravy was gorgeous. I’ve never had real haggis, so have no grounds for comparison, but the animal-free variety is always so pleasing. My fellow did not follow suit, opting instead for the Thai nut burger which quickly raced to the top of his food leaderboard for the weekend. I stole a couple of bites and can confirm that it was delicious – quite spicy, and full of chunks of cashews, really different from any other veggie burgers I’ve had. Was there time for one last dessert? Of course there was! 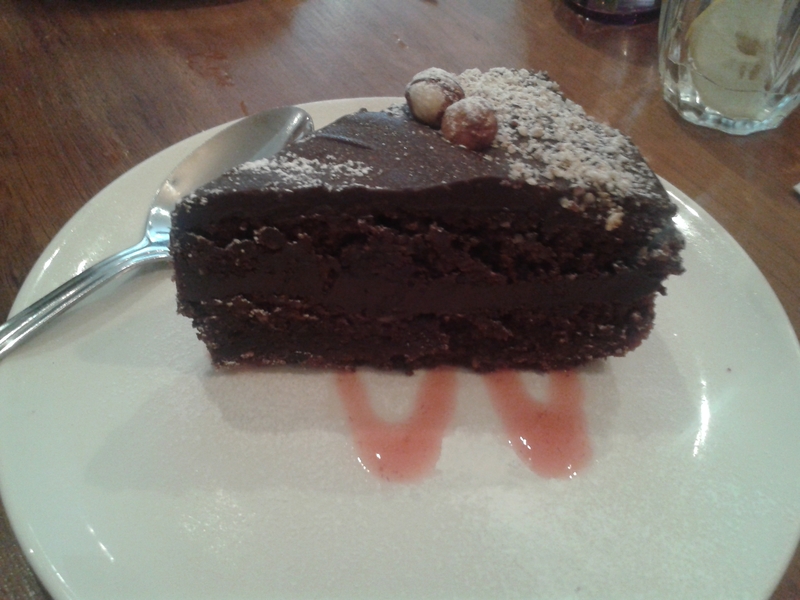 I don’t know if it was a sign of the richness of the cake or the fact that I’d eaten a lot in our four days away, but I ate this chocolate-nut cake more slowly than I’ve ever eaten anything before. It was quite intense, but very moist, and was accompanied by a little dish of ice cream as well. I’m pleased to report that Henderson’s is just as good as I’d remembered, and a fitting end to our holiday fun. 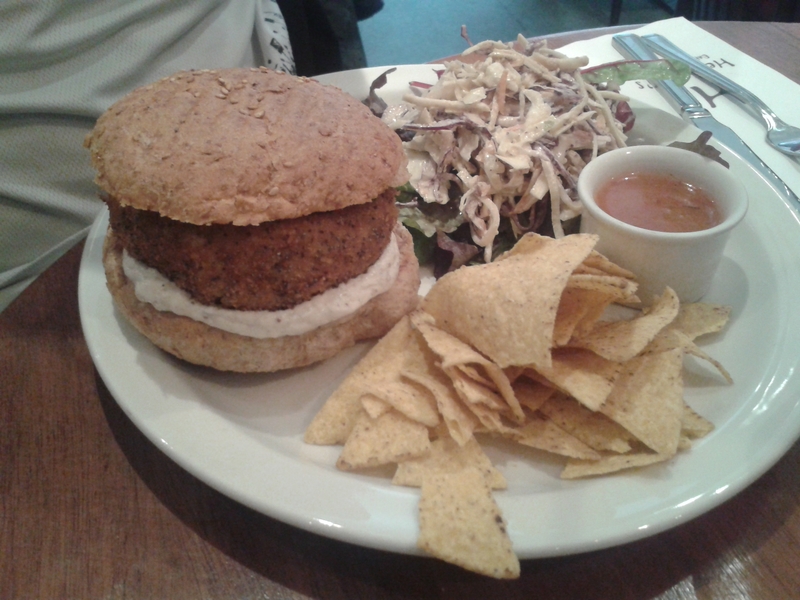 This entry was posted in Travel and tagged David Bann, Henderson's, vegan Edinburgh. Bookmark the permalink.